Some pilots remain confused about GPS-based RNAV approaches, especially procedures with RNP (Required Navigation Performance) in the title and AUTHORIZATION REQUIRED (AR) notes on the chart. For many reasons, those approaches (now called RNP AR procedures) are currently off-limits to a typical IFR pilot flying an airplane equipped with a WAAS-capable, IFR-approved GPS. The situation is becoming more complicated with the publication of RNAV approaches such as the RNAV (GPS) X RWY 24 at KCRQ (see below). Although that procedure is not labeled RNP AR, one transition (from VISTA) includes an RF (radius-to-fix) leg, a curved path that resembles a DME arc, but which requires specific equipment to fly–see below. Many of us flying with GPS units like the Garmin GNS400/500W navigators may not see this procedure in the database, but it may appear among the updated charts you receive from Jeppesen or FAA AeroNav Products. Garmin released system software 6.11 for the GTN series on March 1, 2016. That update includes the ability to fly RF legs on approaches that are not classified as Authorization Required procedures. For more information, see Garmin GTN Avionics and RF Legs here at BruceAir. a. RNP AR approaches include unique capabilities that require special aircraft and aircrew authorization similar to Category (CAT) II/III instrument landing system (ILS) operations. All RNP AR approaches have reduced lateral obstacle evaluation areas and vertical obstacle clearance surfaces predicated on the aircraft and aircrew performance requirements of this AC. In addition, selected procedures may require the capability to fly an RF leg and/or a missed approach, which requires RNP less than 1.0. Appendix 2 of this AC identifies specific aircraft requirements that apply to these capabilities. 2. Characteristics of RNP AR Approaches.a. RNP Value. Each published line of minima has an associated RNP value. For example, Figure 2 shows both RNP 0.3 and RNP 0.15 lines of minima. Each operator’s RNP AR authorization documents a minimum RNP value, and this value may vary depending on aircraft configuration or operational procedures (e.g., use of flight director (FD) with or without autopilot). RNP AR approaches will have an RNP value of RNP 0.3 or less. b. Procedures with Radius to Fix (RF) Legs. Some RNP AR approaches include RF legs. The instrument approach charts will indicate requirements for RF legs in the notes section or at the applicable initial approach fix (IAF). Figures 1 and 2 provide examples of procedures with an RF leg segment (e.g., between SKYKO and CATMI). [Note that the presence of RF legs alone no longer automatically classifies an approach as an RNP AR procedure. For more information, see AC 90-105A and the updated Pilot’s Guide and other documentation related to the March 1, 2016 update of the system software for the Garmin GTN series navigators. More details are also available at Garmin GTN Avionics and RF Legs here at BruceAir]. c. Missed Approaches Requiring Less Than RNP 1.0. At certain locations, the airspace or obstacle environment may require RNP capability of less than 1.0 during a missed approach. Operation on these approaches typically requires redundant equipment. This requirement ensures that no single point of failure can cause loss of RNP capability. Figure 2 provides an example of a missed approach requiring RNP less than 1.0. The notes section of the chart indicates this requirement. d. Non-Standard Speeds or Climb Gradients. 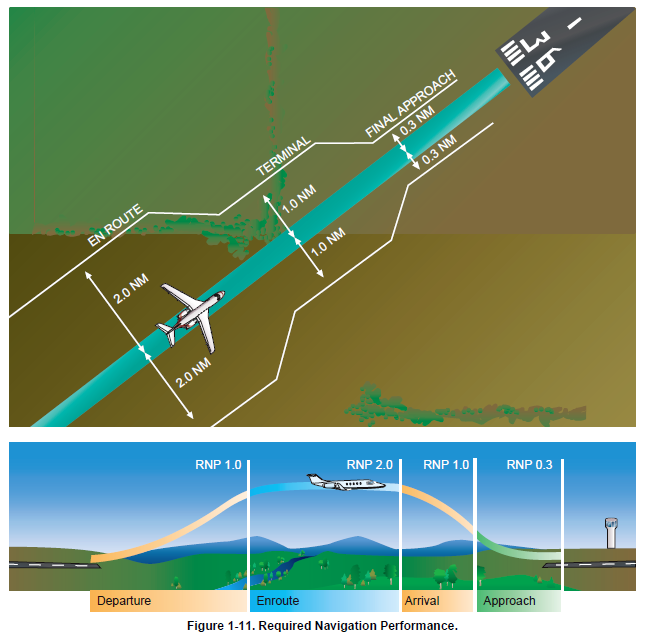 Normally, RNP AR approach procedure design relies on standard approach speeds and climb gradients including on the Missed Approach Segment (MAS). The approach procedure will indicate any exceptions to these standards, and the operator must ensure it can comply with any published restrictions before conducting these approach operations. Figure 2 provides an example of a non-standard climb gradient and speed restrictions. AC 90-101A also describes the training necessary for crews authorized to fly RNP AR procedures and the equipment requirements (beyond a WAAS-capable GPS receiver) necessary to fly those approaches. With all that in mind, it’s important to understand that if your airplane is equipped with, say, a GNS530W or one of the new GTN boxes (with an appropriate AFM supplement), you can fly RNAV SIDs and STARs based on RNP-1 criteria. And you can, of course, fly en route segments that require RNP-2 accuracy. No special authorization is required at these RNP levels. For an explanation of RNP levels, see “Required Navigation Performance” in the Instrument Procedures Handbook (2-34). AC 90-105A, published in March 2016, revises some of the terminology associated with RNAV and RNP procedures, in part to bring FAA conventions into agreement with ICAO standards associated with performance based navigation (PBN). The AC describes Required Navigation Performance Approach (RNP APCH) procedures, which you should not confuse with RNP AR procedures. 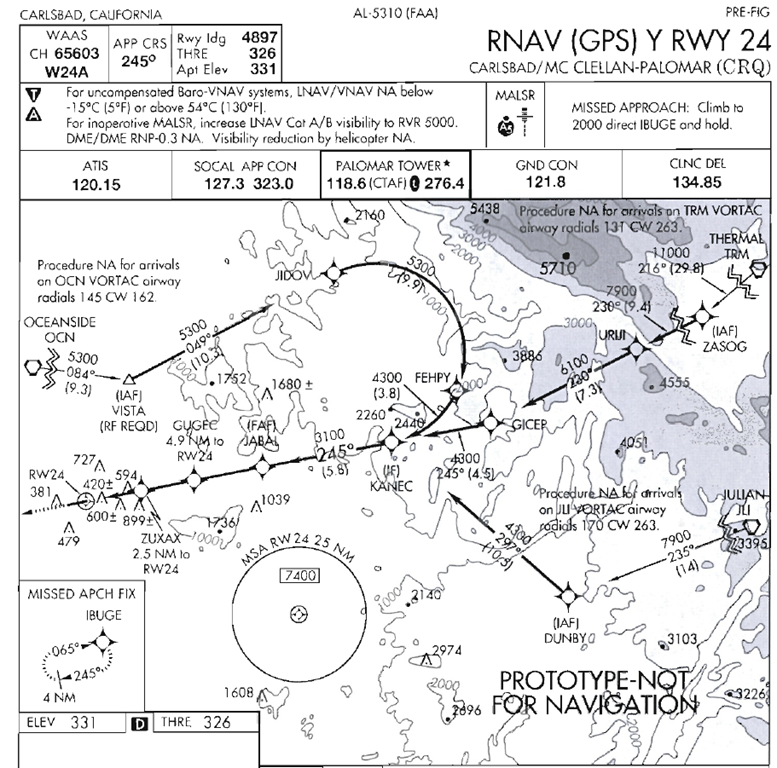 RNP APCH is essentially equivalent to RNAV (GPS). If you fly with an IFR-approved GPS, your aircraft meets the requirements to fly basic RNP APCH procedures as described in the AC. But you can’t fly RNP AR procedures unless you also meet the requirements of AC 90-101A. For more information about operations approved for different IFR-approved GPS units, see AC 90-100A, “U.S. Terminal and En Route Area Navigation (RNAV) Operations,” and the associated AC 90-100A Compliance Table. A good summary of AC 90-100A is available here. Additional details about PBN are at the FAA website here.